Years ago, long before my current 3-year exile in bed with POTS (Postural OrthostaticTachycardia Syndrome), I was casually chatting with some friends. 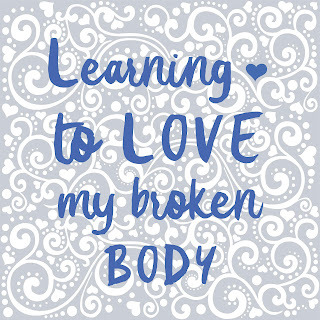 I don’t remember our exact thread of conversation, but something spurred me to blurt out "I hate my body!" The statement came out with such force and vehemence that I startled myself as well my friends, who looked at me with shock and concern and perhaps that "I think she's lost a few loose screws" look. My comment of self-loathing wasn't referring to my body image, my short stocky legs, my desire for a flatter stomach, or anything like that. I was talking about the feelings of utter betrayal I felt for my body. At the time I was dealing with severe endometriosis. Not only was I coping with horrible pain, but I was also struggling with infertility as a result. Anyone who has gone through that, knows what a deep, dark hole it can create. Growing up I had been taught that my body was a temple- a gift from God and something I needed to respect. I had listened and obeyed. I graduated from college with a degree in health education. I exercised regularly, ate well, and avoided alcohol, drugs, and other harmful substances. I had done my part to respect and take care of my body, yet where was the reciprocity that should have insisted that my body take care of me in return? I truly felt forsaken by this body of mine. My strongly worded opinion that day revealed the feelings of anger and loss that were brewing underneath what looked, by all outward appearances, to be a perfectly healthy body. Though I'm a bit ashamed at my frequent lack of faith at the time, I am happy to report that after years of struggling with that painful disease, we witnessed a miracle. 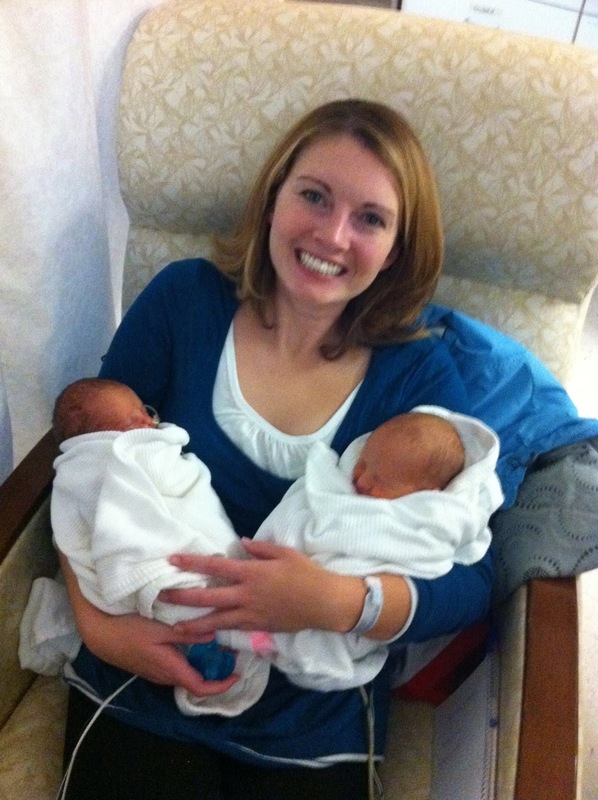 Our beautiful twins arrived to complete our family, and I was able to have a hysterectomy to rid myself of the endometriosis and pain that had been plaguing me for so long. Only a few years went by, however, before I started to experience regular bouts of pervasive pain that sent me to bed for days or weeks at a time. Once again, I felt the sting of betrayal. What was going on and why was my body not cooperating? Though we suspected autoimmune issues, I had a hard time finding answers and treatments. It was in the midst of dealing with these sporadic flares that I was asked to speak on health to a group of women from my church. This was nothing new-- as a health educator and fitness instructor I had given many such presentations before. Instead of turning to my standard spiel on the topic, however, I felt compelled to take this presentation in a slightly different direction. Though I still incorporated some of the typical information on fitness and nutrition, I also wanted to focus on the mental and spiritual aspect of caring for our bodies. I spent extra time doing research and scouring conference talks for ideas and quotes I could use in my talk. Here are a couple of the poignant quotes that really stuck out to me. As I pondered the role of our bodies, my mindset began to shift. I was reminded of an experience I had not long after my mom passed away. My twins were young toddlers at the time-- still so also easily excited by the simple thrills of life. 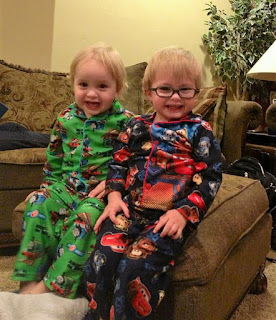 On this particular evening they were playing and squealing with that full-of-joy, contagious laughter that can't help but tug at your heart strings. 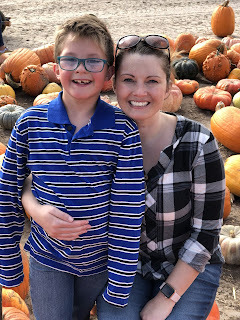 As I sat on their bedroom floor, grinning at their excitement, I had the sudden impression that my mom was there with us, and I could sense how badly she wanted to give them a hug. 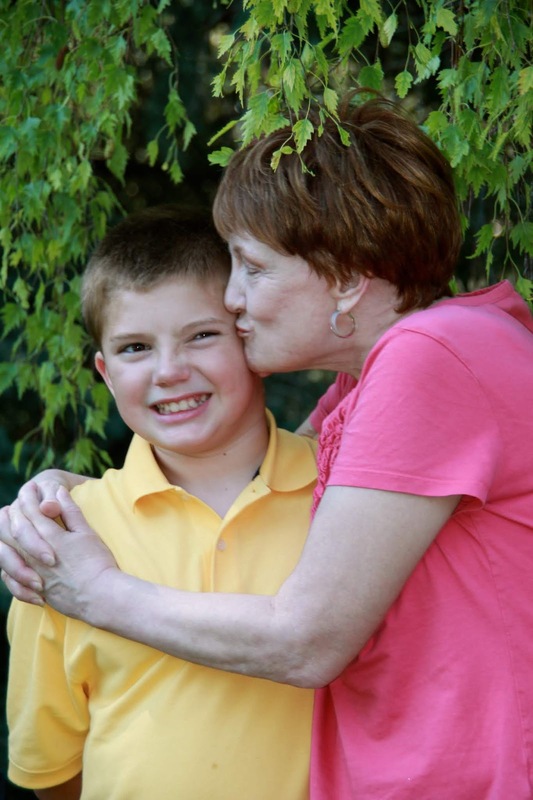 I love this picture of my mom and son. She was such a kissy grandma! As I thought of this experience, I felt immediately humbled. My body didn't always have the stamina I needed to do everything I wanted to do, but there were still a lot of things I could do that I took for granted-- hugging and snuggling my sweet babies being at the top of my list! It was the very week after I gave this talk that my health took an even more dramatic turn for the worse. My body collapsed on family vacation, and I have been mostly homebound and often bed bound ever since. I've thought about this lesson a lot the last three years as my previously fit muscles have turned to flab with disuse. My body has betrayed me over and over again. It has failed to function at the most inopportune times. It has denied me the time upright that I need to physically care for my house and family. It has refused to see me through so many of my kids' concerts and recitals. I have run the full gamete of emotions-- loss, sadness, anger, humility… and even gratitude-- not for this trial, necessarily (I'm not that pious, unfortunately), but for the things I CAN still do. It's always a huge win when I feel good enough to leave the house. 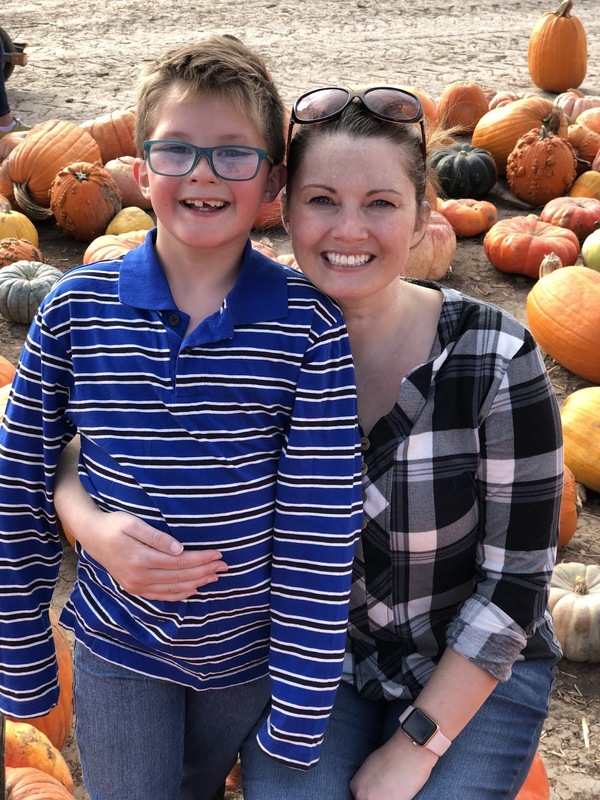 Happy day to have made it to the pumpkin patch with my kiddos this year! I can work on my computer. I can listen to and advise my kids. I can see and feel the warmth of the sun. I can read good books. I can care for my own basic needs (most days). I can hear inspirational talks and beautiful music and welcome their power on my soul. I can empathize and share my love and appreciation for others. At times, I can sit and chat with friends or play games with my family. Though I now share a lot in common with the physical prowess of my 95-year-old grandpa, I can still, on good days, even scale a flight of stairs. And, as previously noted, this broken body of mine can give and receive hugs with those I love. I made it outside with my ear plugs to watch the fireworks on the 4th with my fam. I know that God is well aware of my situation. If my body is an instrument for Heavenly Father's work, as Elder Sitati declared, then I have to believe that, even in my broken state, God still has a purpose for me and a means for me to fulfill that work. Though I may not be able to be the physically active mom, wife, sibling, friend, kind stranger, etc that I idealistically WANT to be, I can still be the person I NEED to be for myself and those around me as I actively seek direction and listen to that still small guiding voice. Yes, I still have times of mourning, anger, and discontentment. I'm not even sure, at this point, that I can honestly say that I love my body-- but I am working on it. And I do have a newfound respect and appreciation for it. 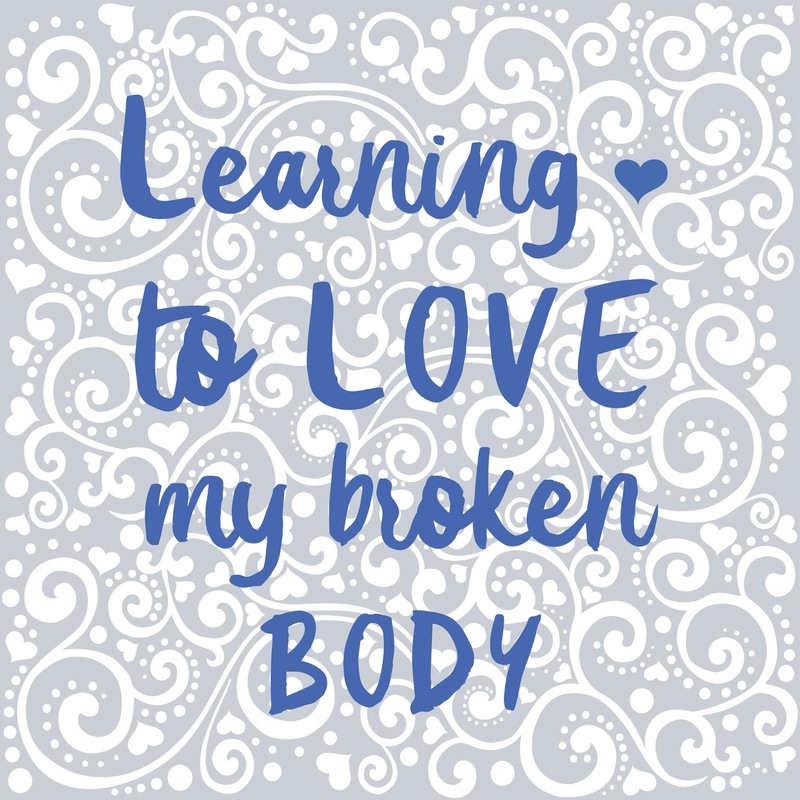 I know that as I continue to creatively seek to help others in the ways I am able and focus on all the things I CAN do and everything I have to be grateful for, I will learn to love this broken body.